I've been looking at all the amazing crochet bookmarks on Pinterest and finally sat down to write my own bookmark pattern. It's a bunny! This is a quick pattern to make this cute bookmark as a gift for a little booklover and it doesn't take much yarn. This is a really good project for your scrap yarn. I would like to thank my pattern testers. You can check out their amazing work on Instagram. The bunny on the picture was made with Catania by Schachenmayr which you can purchase online e.g. here. You can use any thin yarn ("fine" oder "2"). You need one ball of your color of choice and a little bit of a contrast color to emboider the face, a hook (I used a 3mm hook), a needle to sew in the ends and a little bit of stuffing. 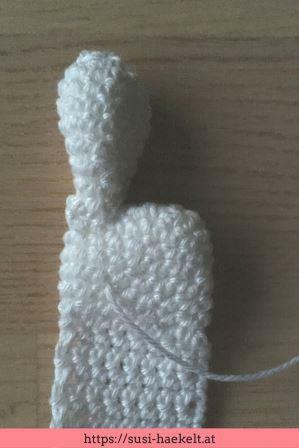 R1: start with the second stitch from the hook. 6 SC in the next 6 stitches (back loop only). 2 SC in the next stitch (blo), now turn the project arround to continue on the other side of the chain. 6 SC in the next 6 stitches in the remaining front loop of the chain. 2 SC in the next stitch (flo) to create a round. Work in continuing rounds without closing. 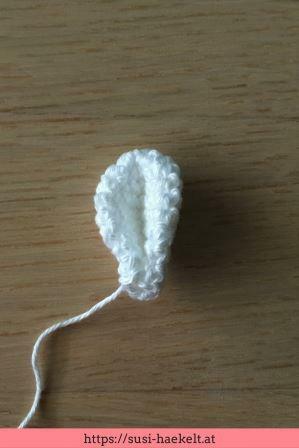 Use a stitchmarker in the first stitch of each round. If you want, you can embroider the face now (see "face"). I like to do it at the very end. R8: Stuff the head a little bit and close with 8 SC through back and front of the head. Repeat R10 until you like the length of the bookmark. Break the yarn and sew in all ends. If you want, you can pimp your bunny bookmark with pompoms or a bow or whatever you can think of. Get creative! 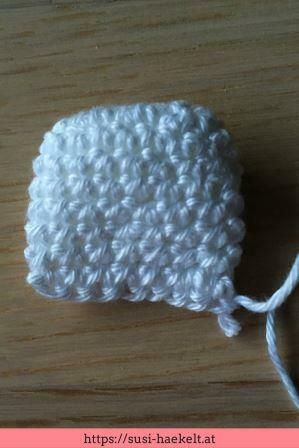 Crochet in continuing rounds without closing. Close the rounds with a slst and leave a long tail to sew on the ear. Fold the ear and sew it together with 3-4 stitches. Ears (1 stitch high, 1 sitch wide), stitch 2-3 times top to bottom, 3 stitches between the eyes. Nose (1 stitch high, 1 stitch wide), stitch 2-3 horizontally around the stitch between the eyes. There is one gab between the nose and the eyes. Stitch once from the nose down. Sew in all ends. You just finished your bunny bookmark! If you have any questions, feel free to ask. If you post your bunny bookmark on social media or on your blog, please tag me so I can see your work.